WhatsApp added a new feature to its messaging applications that you may use to delete messages that you sent already using the client. Messages that you sent up until now could not not be deleted by you after the fact. There was no grace period to undo the sending, and it seems that users requested such a feature which works similarly to how email providers like Gmail provide undo options for a short period of time after sending messages. 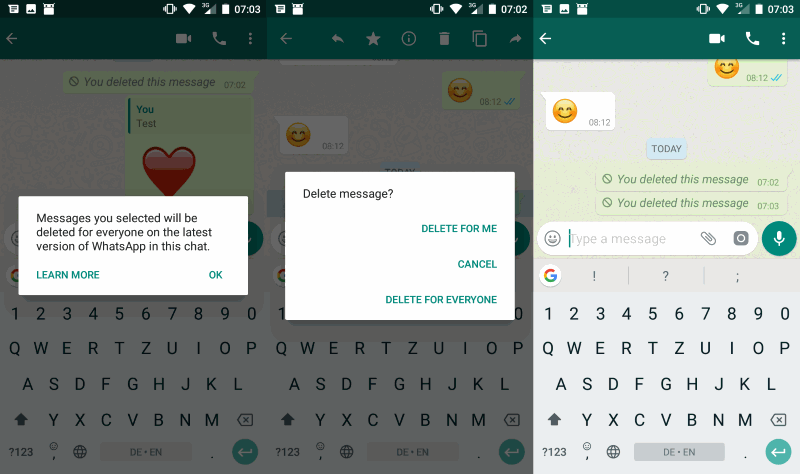 This changes with the new deleting messages for everyone functionality that is implemented in the most recent versions of the WhatsApp client for Android, iOS and Windows Phone. The new feature has requirements that need to be met. Messages can only be deleted remotely (read: for everyone), if seven minutes have not passed since they were sent. Sender and recipients need to use the most recent version of the WhatsApp client. WhatsApp won't notify you if the deleting of the message is not successful. It may still be deleted on the device that you are using, but it may not have been deleted on the recipients device. Also, recipients may still see the message before it is deleted. So, how do you delete messages that you sent using WhatsApp? Open the chat and scroll to the message that you want deleted. Long-tap on the message that you want to delete. Optional: you may tap on additional messages to mark them as well and delete them in one go. Tap on the trashcan icon in the interface. Select the "delete for everyone" option to have WhatsApp delete the selected message locally and remotely. Deleted messages are marked as such in the conversation history along with the time they were deleted. There is no option to restore deleted messages however. WhatsApp notes that the feature is rolling out currently. It may take a while before it is available to all users of the messaging service. The option to delete messages is a handy one; you can delete messages that were sent in error, for instance to the wrong contact, or messages that you sent but want removed for other reasons. The downside is that you will never know if the message was deleted successfully remotely, and whether the recipient of the message read it or not. No doubt this new addition is very handy one But It should have deletion notification. Do Not Use this App! EVER! Why? Those are the permissions that 90% of Android apps ask! WhatApp being closed source and owned by Facebook is a stronger argument against using WhatsApp. Yes, but we can include all that into it as well. … and people really believe that this also deletes server side stored messages … I need to laugh. I need to laugh if you think that Whatsapp is for more than just casual conversations. I have to laugh if you really think everybody out there only uses it for casual conversations. You’re missing my point. CHEF-KOCH made a snarky remark about Whatsapp not actually deleting messages off their servers. My response was to him. I use Whatsapp for casual and business conversations, but I would not send SENSITIVE information over Whatsapp. When I said “casual conversations”, I also mean “casual business conversations”. Please take a reading comprehension course next time. @Gabriel, what CHIEF-KOCH said was true. Delete doesn’t mean delete forever. There’s a good chance there’s a copy of it left behind so other people will read it. You’re just upset that you use WhatsApp in spite of knowing this, probably due to habitual messaging. People need to realize there’s a price to be paid for popular convenience. Just because you think you’re careful doesn’t mean everybody else out there is. It probably is true and I never denied it. Did I? That was why I said that if you use it for anything else than for casual conversations, then you’re dumb….. because messages aren’t deleted. Please learn how to read. Thank you.